Dark Legends is a vampire horror adventure and 3D Massively-Multiplayer Online Role Playing Game (MMORPG) available for Android on Google Play and for desktop via the Chrome Web Browser. In the online world of Dark Legends you’ll fight for survival alongside millions of players from around the world in Co-Op or PVP action. You’ll face hunters, werewolves, demons and much more in the bloodiest Legends title ever. Spacetime Studios takes its mobile and desktop Legends franchise into a frightening new world with Dark Legends. Players will embrace the secret societies of vampires to challenge the hordes of undead, werewolves, demons and humans that hunt them. Fans of the popular Legends franchise, Pocket Legends and Star Legends, will discover a gameplay evolution in Dark Legends that draws them even deeper into the experience. The combat system delivers fast paced, action oriented gameplay that includes new mechanics such as charge attacks and the ability to drain enemies. A wide breadth of solo and multiplayer content will also be available. The most significant change is a much deeper focus on narrative. In addition to story communicated during the 3D multiplayer missions, players will periodically be given the option to complete quick action missions with a single tap. These missions use brief cut scenes to create an interactive storybook, where players experience the life of a vampire up-close and personal. The company’s goal for Dark Legends is to combine casual, strategic advancement content with their award winning real-time 3D multiplayer system to create a blend of gameplay never before seen. 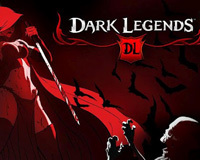 Dark Legends opens with the player recently raised and under the direction of the vampire that sired them. The secret existence of vampires has been exposed and angry, misguided humans are uniting to exterminate the undead plague by any means necessary. Players must work with their clan to survive this brutal new world. The previous Legends titles, fantasy Pocket Legends and sci-fi Star Legends: The Blackstar Chronicles have been downloaded more than seven million times, making it the world’s largest mobile MMO franchise.